Machzor is a Jewish prayer book in Hebrew for the Yom Kippur holiday. In the machzor there are prayers in Hebrew and in Yiddish (translation of "Beit Yisrael"), which are read during the Yom Kippur (Day of Judgment) holiday which is observed on the 10th day of the month of tishrei according to the Jewish calendar. Also in the machzor there are the comments to the texts of prayers "Pninim Yakarim" in Yiddish. Machzor has 340 pages. 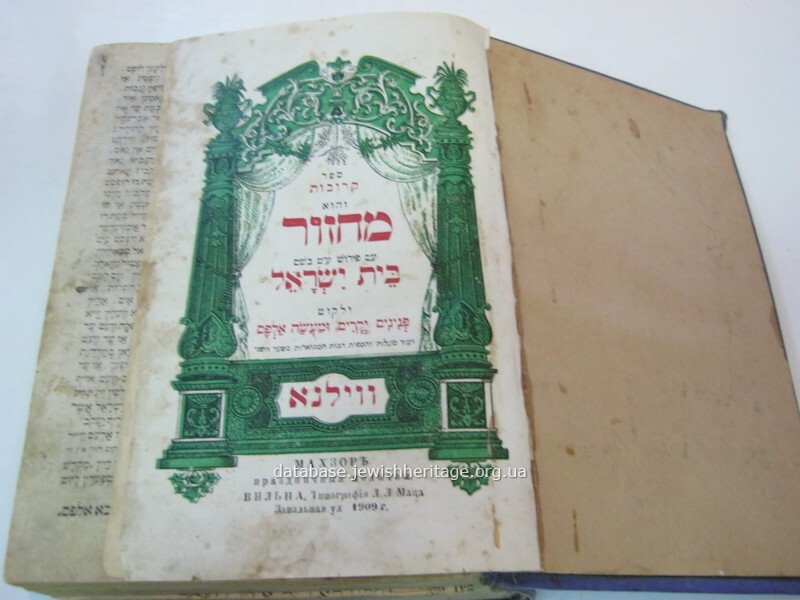 The title page of the machzor contains the elements of art-design and is colored (decorated in black, green and red). The book is printed in the printing house of L. L. Matz in the city of Wilna. The cover of the book is blue made of calico with embossed Star of David. From a Jewish family. Transferred by Kobusov A. B. from the city of Mykolaiv. In 1985 it was added to the register. The book contains the texts of the prayers Mincha (afternoon prayer) in the eve of Yom Kippur holiday, Maariv (evening prayer) and Shaharit (morning prayer), Neila, the order of Torah reading in Yom Kippur and performing of kapparot ritual, etc. Yellowed paper, brown spots, the pages become unstuck, the cover is worn.